London - A personal best swim took Saturday night’s gold medallist, Charl Bouwer, into the final of the men’s Paralympic 100m freestyle on Sunday morning. Bouwer who won the S13 50m freestyle dash on Saturday evening, clocked a personal best 53.28sec and only a world record 52.08 by Ihar Boki of Belarus was quicker in qualifying, reports SASCOC. 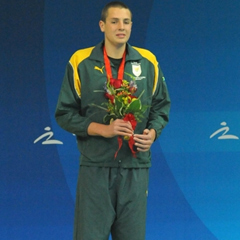 The Stellenbosch based Bouwer won gold in the 400m free in Beijing. “But I think the 50 and 100m are more my events now,” said Bouwer. Hendri Herbst, bronze medallist in the 100m free earlier in the competition, failed to progress in the S11 backstroke heats, his 1:14.76 only ninth fastest. Also failing to go through was Marike Naude in the women’s 100m free (S13) as she swam a 1:11.45. She would have needed a 1:05.45 or quicker to qualify. On the track our two men’s 400m competitors both went through to the final in the T38 class. Union Sekailwe was quickest with a 53.28 (third in his heat) while Marius Stander won his heat with a 53.52. They were third and fourth fastest qualifiers for the final. In the field events, Chenelle van Zyl ended ninth of 10 competitors in the women’s shot put (F35 class) with a best of 7.83m. Out at Greenwich Park, SA's Beijing double gold medallist dressage ace, Philippa Johson ended 11th in the Grade IV individual championship test, her and Lord Louis riding to a score of 65.774 behind winner Michele George of Belgium (77.065%). And at Eton Dorney, venue for canoeist Bridgitte Hartley’s Olympic bronze medal a few weeks back, our adaptive rower, Sandra Khumalo, placed second in the single skulls B Final. She clocked a time of 6:18.88 behind winner Jongrye Lee of the Republic of Korea (5:57.86). At the other Eton venue being used for the Paralympics, in this case Eton Manor, wheelchair tennis player Evans Maripa went down in straight sets to France’s Frederic Cattaneo, losing 6-1 6-4.